Symbolism plays an important role in Hindu religion. 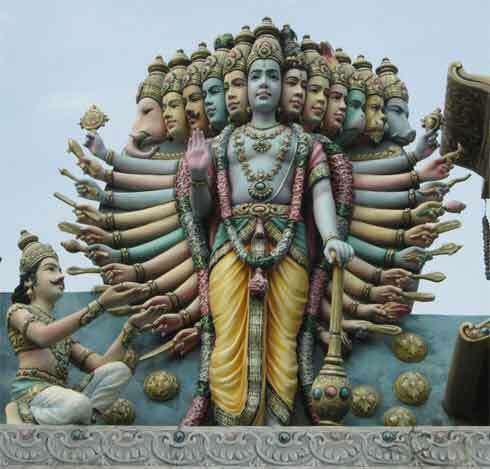 We find Hindu gods and goddesses having several head sometimes two, three, four or five. Multiplicity of heads denotes presence of their concurrent abilities. It also symbolizes shaktis or powers like iccha (will), jnana (consciousness) and kriya (action). Four heads symbolizes the four Vedas. It also symbolically indicates that the deity guards four directions. Five heads symbolizes the panchabhootas or the five elements. Five heads also symbolizes creation, expansion, withdrawal, concealing and preservation until the next cycle of creation. It must be also noted that with the development of society new sects and cults appeared. Such cults and sects were blind followers. To show that their deity is more powerful, they started adding extra heads. Multiple heads are also an attempt to capture the core teaching of Sanatana Dharma in a form – birth, sustenance and death happen in the Supreme Truth (Brahman). This is displayed through the Vishwaroopa Darshan in Bhagavad Gita.